Teachers are in the position to observe the development of verbal language skills in their classrooms. When a child’s speech is unintelligible or inconsistent, apraxia of speech should be considered. Treatment of the disorder is essential to help the child develop the ability to accurately and consistently form words. This article explains what the disorder, details the symptoms and discusses the treatment and prognosis. Apraxia is a disorder that affects the ability to perform skilled movements and gestures in people who have normal physical abilities. There are several types of apraxia, each affecting different parts of the body and functions. Apraxia of speech is one type, and is also known by other names, such as verbal apraxia, dyspraxia developmental, verbal apraxia, developmental verbal apraxia, articulatory apraxia and childhood apraxia of speech. Children with apraxia of speech have difficulty consistently producing the correct tongue and mouth movements required to construct words. The severity of the disorder can range from mild (it only causes occasional difficulties with speech or the person may only have difficulties with a few types of sounds), to severe (the person cannot lacks any form of intelligible speech and must use a different mode of communication). Verbal apraxa is not caused by physical defects in the muscles, tongue or face, and intellectual ability is not a factor. Children with normal or even above average IQs can have verbal apraxia. The exact cause of the disorder is unknown. Some scientists believe apraxia is a neurological disorder where the language pathways in the brain are not properly communicating with the muscles needed to form words. There are two main types of apraxia of speech: developmental and acquired. Developmental apraxia of speech is present at birth. It is more common in boys than in girls and seems to occur more often in children who have a family history of speech disorders or learning disabilities. Children with the developmental form of the disorder may also have other co-occurring learning disorders. 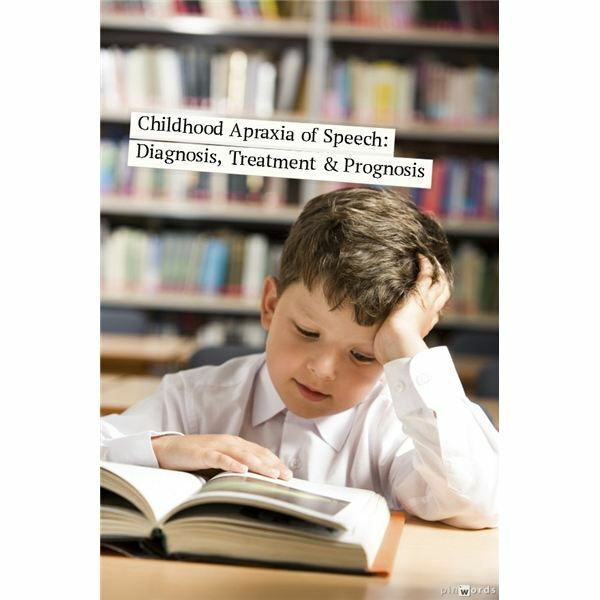 Acquired apraxia of speech can occur at any age. It develops due to damage in the speech center of the brain, which can be caused by some tumors, strokes, impact injuries to the brain, and other conditions. People with the acquired form of the disorder may also have physical muscle weakness or paralysis that further complicates speech. Children with developmental verbal apraxia do not outgrow the disorder; treatment generally can offer help. People with acquired verbal apraxia may or may not improve spontaneously or overtime, depending on the whether or not the damage to the brain repairs. Because many young children are late talkers and catch up quickly to their peers, it can often be difficult to determine if a child has apraxia or a speech delay. Children with apraxia of speech often are very quiet infants who do not coo or babble. They commonly do not say their first words until well past one year of age and they tend to use very few consonant and vowel sounds. Once these children begin talking, they may simplify difficult sounds and make inconsistent errors with sounds. These children often make groping motions with their mouths and tongues as they try to get the words out and may try to say a word several times before succeeding. They may speak a word one day and be unable to repeat it the next. Many children with verbal apraxia cannot properly control the tone of their speech, improperly vocalizing inflections that add to the meaning of words. Most children with apraxia of speech understand language much better than they can speak it. There is not an established set of criteria used in the medical community to diagnose verbal apraxia. There are various testing and observation methods used by speech language pathologists (SPLs) to make a diagnosis. Generally, a speech language pathologist observes the person’s use of sounds and words over a period time. Verbal tests, asking the person to say and repeat sounds and words are commonly performed. The SPL may order tests and work with other doctors to rule out other causes of speech delay before a diagnosis is made. An diagnosis is typically not made for children under three years old. However, an SPL who suspects a young child has the communication disorder, may give the child a tentative verbal apraxia diagnosis. There is no one proven treatment for apraxia of speech. Treatment usually involves intensive and frequent one-on-one therapy with a speech language pathologist. The particular method of treatment varies with each medical professional. The prognosis for children with verbal apraxia varies based on the severity of the disorder, the age treatment is started and the type of treatment used. Most children reach a point where they are understood by strangers. A very few are not able to become verbal communicators after treatment and must rely on alternative forms of communication such as sign language, electronic communication devices or written language. With target speech therapy and early intervention, most children with apraxia of speech can make great strides with their speech abilities. Support from both family and teachers is crucial in the success of treatment.